Part 3 of our series on interesting facts and background to the Mexican War addresses the U.S. declaration of war and the factors leading up to it. You will recall from part 2 that the U.S. saw two distinct threats to its ability to gain control of the Pacific Coast: Britain, which owned land from the southern border of today’s Alaska to the current southern border of British Columbia, Canada, and which had designs on the disputed territory just south (today’s States of Washington and Oregon); and Mexico, which owned Upper California (today’s State of California). Britain was taken out of the picture by the 1846 Oregon Treaty, which removed British claims to the disputed territory. Now there was only Mexico to deal with. Relations between the two countries had been strained by the Texan independence movement, in which American citizens who moved to Mexico to settle its northern state of Coahuila y Tejas decided, after a short residence, to create an independent state there called Texas. The Mexican government responded in 1829 by levying a property tax, putting high taxes on American imports, and prohibiting slavery. Because Americans in Coahuila y Tejas outnumbered native Mexicans, and because internal political strife in Mexico made it difficult to fully command the northern states, they were able to ignore those laws, particularly the one against slaveholding. But when General Antonio López de Santa Anna became dictator of Mexico in 1834, he was determined to bring Coahuila y Tejas firmly back under Mexican control, and when the Texans declared their independence in 1836, Santa Anna traveled north to squash them. Santa Anna’s defeat at the Battle of San Jacinto seemed to leave the Texans free to declare their independence. They did so, claiming all the territory in yellow on the map below (courtesy of Wikipedia), which they actually had settled, and then all the land in green as well, which they had not, and which, as you see, extended all the way north into Wyoming. Because of the unsettled state of Texas, with its disputed borders and no official treaty with Mexico stating that it gave up Coahuila y Tejas, the U.S. was relatively slow to move when Texans made it clear they wanted to join the Union. The biggest potential problem was Texas’ claim to the Rio Grande as its western border which, as you can see, cut deeply into Mexico. U.S. politicians realized Mexico would not accept the U.S. annexing a new state that claimed so much Mexican soil as its own. 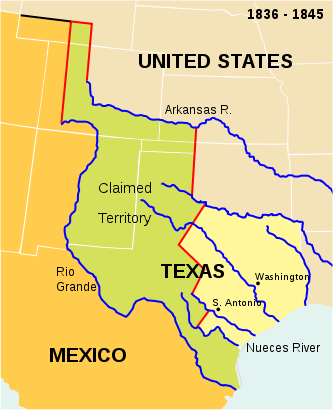 When Texas was brought into the Union, in 1845, no mention of the Rio Grande border was made, and the U.S. made no formal claim to the land up to the river. Still, Mexico was outraged with the annexation of Texas by the United States. Mexico had never officially ceded Coahuila y Tejas to the Texans. It was both the disastrous political instability in Mexico City and pressure from Britain and France, both of which had recognized Texas as a U.S. state, that kept the nation from immediately marching the full force of the army into its northern state and reclaiming it. Mexico did not declare war, but did break off diplomatic relations with the U.S. In response, President Polk, who wanted the Rio Grande border, sent General Zachary Taylor to Texas to claim it. Again, Texas and the Rio Grande were just a means to an end for Polk and for most Americans—controlling the western lands up to the Rio Grande was one step closer to owning the Pacific, and Upper California. An army launched from the Rio Grande could be in California much sooner and with much less difficulty than one launched from the Mississippi River. This is made clear by the secret cash offer Polk made to President José Joaquín de Herrera on November 10, 1845: $25 million for the lands up to the Rio Grande, and also for Upper California and Santa Fe de Nuevo Mexico; U.S. forgiveness of a $3 million debt Mexico owed the U.S.; and another $25-30 million to sweeten the deal. It was too late. Mexicans were outraged when the deal was made public. They would not be bought. National honor was at stake. President Herrera was accused of treason for having entertained Polk’s representative and was deposed. The new government under General Mariano Paredes y Arrillaga stated its intention to re-claim Texas and retain all of Mexico’s northern states. Polk ordered Taylor to take his army to the Rio Grande—into Mexico itself—and ignored Mexican demands to withdraw. This invasion sent the Mexican army north, and in April 1846 sixteen American soldiers on a patrol were killed by Mexican cavalry at the Nueces River. The Nueces, as you can see on the map, is just north of the Rio Grande in the boot of modern-day Texas and was the actual border of Texas (unlike the Rio Grande, which was the Texans’ desired border). Polk went to Congress on May 11 and stated that since the attack had occurred on the Nueces, officially U.S. territory because it was the actual State of Texas, Mexico had “shed American blood upon American soil”. Polk asked Congress to declare war, which it did on May 13th. Mexico was likely irritated to hear the Nueces righteously claimed as American soil, since again there had never been a signed treaty handing over its northern state to the Texans or to the U.S. It declared war on July 7. The debate in the U.S. Congress over whether to declare war fell along party lines—Whigs being mostly against it, Democrats being mostly for it. This sounds familiar to us today, but it was not the norm back then (see The Birth of Red and Blue States for more on this.) The Democrats were becoming more identified with Southern slaveholding interests. They wanted to fight for Texas, and the rest of northern Mexico, to make more slave states, and to bolster the slave-state population. Pro-slavery Americans worried that their influence was shrinking as the west was won in more northern areas. The free North was expanding faster than the slave South. If stalwartly slave Texas could be secured and substantially expanded west, it would be easy to continue the westward drive of slavery through what would become New Mexico and part of Arizona (Santa Fe de Nuevo Mexico) and the great prize of California itself. The Whigs were becoming more identified with Northern free state interests, and knew exactly why the Southern Democrats were so eager to go to war. In the end, however, the Whigs were not united enough to challenge the Southern Democrats on the slavery issue, or to resist the war fever that swept Washington. They also longed to annex California, the most desired land in the west, and so they voted for war.